At The Long Center, in Clearwater, Florida, we are now conducting pickleball tournaments on a regular basis. 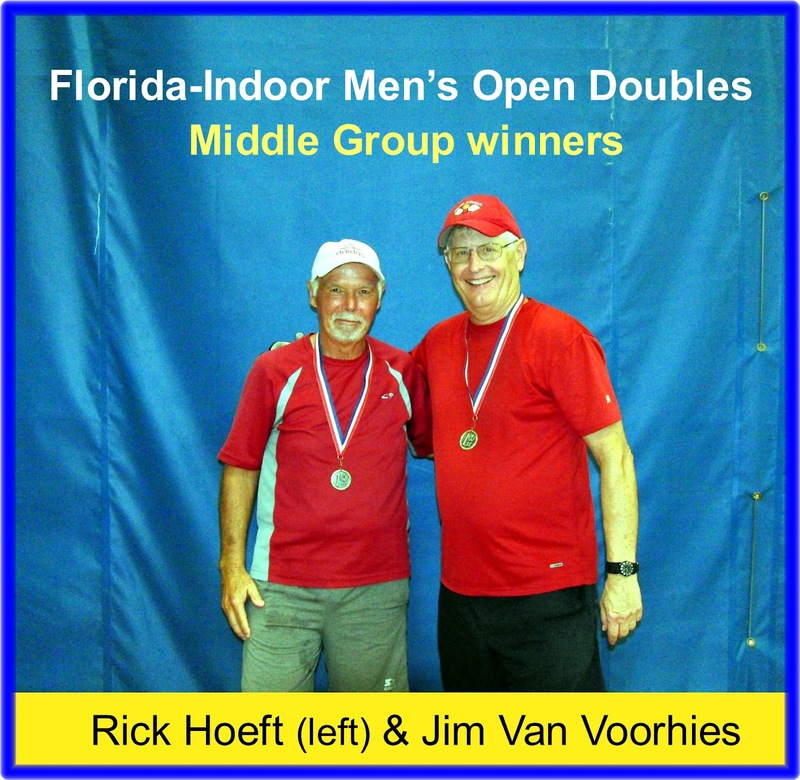 On Thursday, July 11, 2013, we held our first Men’s doubles tournament. The competition included 10 teams. Round one of the competition was comprised of two seeded round robin groups of five teams each. The 1st and 2nd place finishers from each round robin group, advanced to the ELITE semi-finals. The 3rd and 4th finishers advanced to the MIDDLE group semi-finals. The last two finishers played in a LOWER group final match. 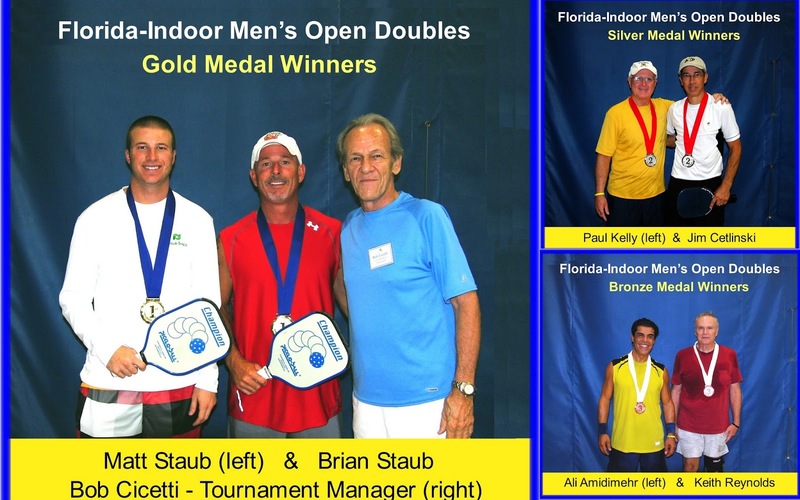 In the ELITE group competition, Matt Staub and Brian Staub won the gold medal, Jim Cetlinski and Paul Kelly won the Silver medal, and Ali Amidimehr and Keith Reynolds won the bronze medal. In the MIDDLE group competition, Jim Van Voorhies and Rick Hoeft won the first place medal. Pedro Arevalo & Danny White, Jan Hoogland & Frank Terlitz, Rick Whissel & Alan Butler, Jon Hilliard & Bob Berkstresser, John Petterson & Tom Goodnight, John Smalley & Dale Scott. 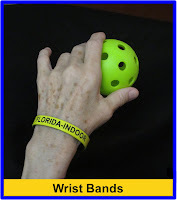 Florida-Indoor complimentary wrist bands were passed out to all the participants before the matches began. The player that starts the serve for each team, at the beginning of the game, wears the wrist band. When the player with the wrist band, is in the right hand court, the score for his team will always be an even number. When the player with the wrist band, is in the left hand court, the score for his team will always be an odd number. This applies to both teams. The wrist bands help to keep the correct score and ensure that each player is on the correct side of the court. Thanks to Bob Cicetti (Volunteer Pickleball Manager at the Long Center) for a great job of managing the tournament. Thanks to Shaun Beasley, The Long Center Manager, for providing a very nice buffet lunch to all the competitors and helpers, at noon, after Round 1 was concluded (at the end of the round robin competition). Our next tournament is scheduled for Friday, September 20, 2013. This tournament will consist of one event, combining 12 high level teams of Men’s, Women’s and Mixed doubles competing against one another. All the players participating in this event, will play the entire tournament session. Click on this link http://www.FLORIDA-INDOOR.weebly.com for more information about this unique and exciting event, or call Alan Butler, at 813-466-8284.